The holiday season is a time for giving, so why not give an SME the greatest gift, a nomination for a Blacknight SME Award. Blacknight is pleased to announce that nominations for the 2016 Blacknight SME Awards are currently open through January 7, 2016. The SME Awards celebrate the best of Irish SMEs, with 18 categories ranging from Family Run Business to Environmentally Minded and everything in between. Unlike many business awards, nominations are free, saving smaller businesses hundreds of euros and allowing a broader range of entries. Each business is judged in two rounds before they make the final. The judging panel is comprised of business people and members of the public. 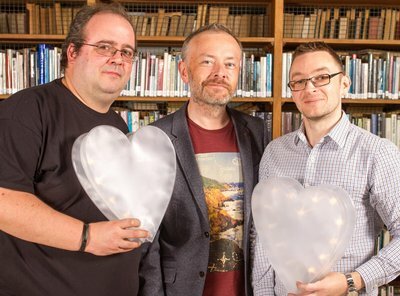 This year’s awards promise new categories, bigger crowds and the signature charm of organiser Damien Mulley who explains that the event is important because: “SMEs are the lifeblood of the economy, they employ way more than the Googles and the Facebooks, don't get the press and pay a lot more tax." A recent study done by Vision Net, compliments Mulley’s sentiment as it states that 17,300 new businesses were setup in the first 11 months of 2015, with 147 new businesses being created every day in 2015. The Blacknight SMEs now in their second year expect upwards of 300 Irish SME representatives. This year, however, there will be one big change - the Startup category is dropped in favour of the category “New Company”. “’Startup’ is becoming a dirty word,” Mulley explains. "Last year judges encountered many businesses for which it appeared that the sole goal was running a startup and they were spending their time talking about the fact they were a startup. Companies that focused on keeping their business alive while gaining new customers to sell a product or service did much better in the competition. The latter are the companies we want applying to this category and "New Company" describes them better than "startup". Nominations close January 7th 2016. Late nominations are €150 per category in the first day and €300 per category if 48 hours late.